Out of three categories of vinery Newton there are two wines belong to the “red” line, which is actually the affordable one (or the lowest one). Probably Pinot Noir, Syrah, Zinfandel and Cabernet Sauvignon are the most present red sorts of wine at California. In my point of view the most relevant is Cabernet Sauvignon. Napa County or any other Northern Californian wine area provides appropriate soil and weather conditions for all mentioned sorts of wine for sure, but if I consider how hot it can become in these areas I guess Cabernet Sauvignon is very appropriate. I already reported about Newton – https://avdwineandfood.net/2015/03/15/newton-chardonnay-2007-napa-county/ – so I would not need to write too much about the winemakers which I don’t know personally even I would like to. This red is a really dry one. Opposite to so many other Californian wines this one has much less fruitiness, a very individual character and even a rather cold appeal. There are slight notes of tobacco, a little bit vanilla (not a sweat one! ), but also pepper and black currant flavors. Considering California you would perhaps not affiliate currant as additional note but this wine cares flavors of it. There is a kind of wildness – not comparable of real wildness as any Marco Fon wine (https://avdwineandfood.net/2015/07/26/vinogrado-fon-teran-2011/) – but the makers of this wine are more courageously since the taste of their wine may not fit to average wine taste. A fortiori they deserve respect for this wine. What I like to criticize is that they try to subdue the kind of wildness throughout oaky barrels. I am not too sure up to which extend this is the case as I haven’t been at Newton vinery, but it is my impression drinking the wine while second day. Bearing in mind how many American wines are too woody, too mandelic (which means a little bit dominated by almonds notes) this Cabernet Sauvignon is still very fair balanced. Again, one of the abiding impressions of the wine is its sympatric but real substantial dryness. The skin of grapes, the wood of vinery along with the imagination of some dusty but rich soil combined with the mentioned fruit experience makes this Cavernet Sauvignon to a very special and highly interesting experience. Since this is something I personally would call a male wine, I guess having a Burger with this wine could fit. Aside of this, you would need some rather heavy – yes – American food for this wine as mashed potatoes, French fries, perhaps avocado or simply a rich omelet. Ironically I can image that wine collectors and selected experts are not having this wine on their map because it belongs to the lowest level of Newtons. But this is, in my point of view, generally not a criterion. In the US you can a bottle for ca. US$ 25 which is in my point of view much too much for this wine! 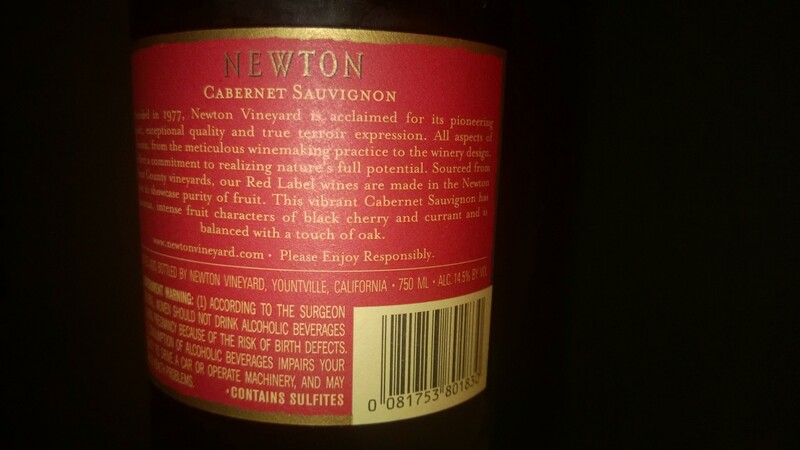 Find more about the wine at http://www.newtonvineyard.com/.